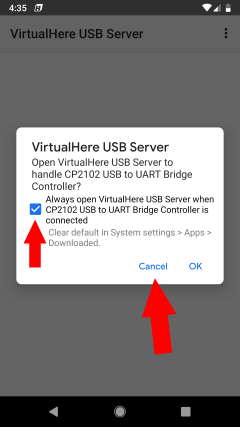 Another question may popup asking if Android should open VirtualHere all the time when the device is plugged in. Check Always... then click Cancel. You can press the back button in Android and the VirtualHere App will continue to run in the background. The VirtualHere icon will appear at the top of the Android screen and you can click this to bring up the VirtualHere server dialog again. 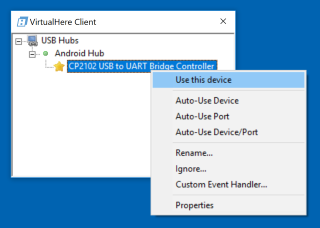 My client pc is not detecting the VirtualHere Android Server? 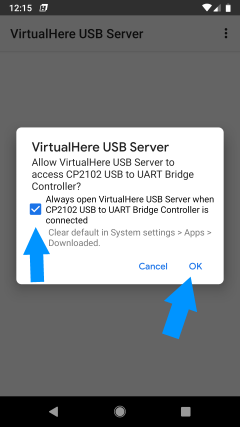 Bring up the VirtualHere Menu at the top right and select "Exit"
How can i remove the USB device authorization popup so any usb device can be used straight away?